when i first crafted these, i didnt think that it will be popular. Just wanted to do something different using metal clasp frames. Turns out, the iphone clasp pouches are a Hit! :)) Well, i guess cuz its different. So far, i have seen zipper iphone pouches, draw string ones, sock ones, plastic, leather etc etc but no metal clasp frame ones. 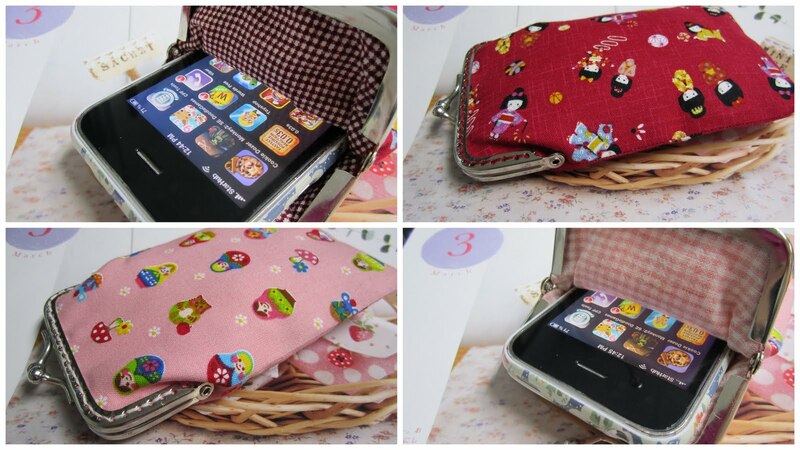 Anyway, Ms G's having her fair at Liang Court this week again and she said some customers were looking for the iphone clasp pouches. I have crafted some during my Shanghai trip but tot i better do up a bit more, just in case those fly right off the shelves! I forgot to take pictures of those 'made in china' pouches but i have for these latest 6 pouches. Here they are. My first love is for russian dolls. I like anything in russian doll prints - fabrics, pouches, cups, houseware etc. And my second fave has to be these kokeshii dolls from japan. And between the animal prints, i heart the hedgehog ones. KK got this, amongst many others, from her japan trip last year and i snipped off a small bit of her pretty stash. So, i only have enough to make one iphone pouch with this hedgehog print, and maybe another small pouch. As for cheery bright red hippo print, it was discovered by Lak. I wouldnt have choosen it myself. 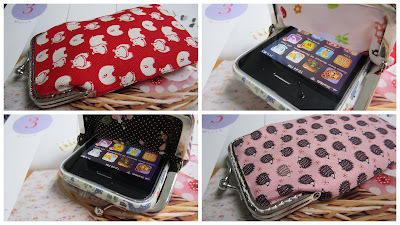 She chose this print and tasked me to craft a big clasp pouch for her 2 yrs ago and she has been using it since then. And in this last picture, these two prints are hot favourites and i have been using it repeatedly for quite a few pouches already. One's so sweet looking, another's very cute! Where is my iphone pouch? 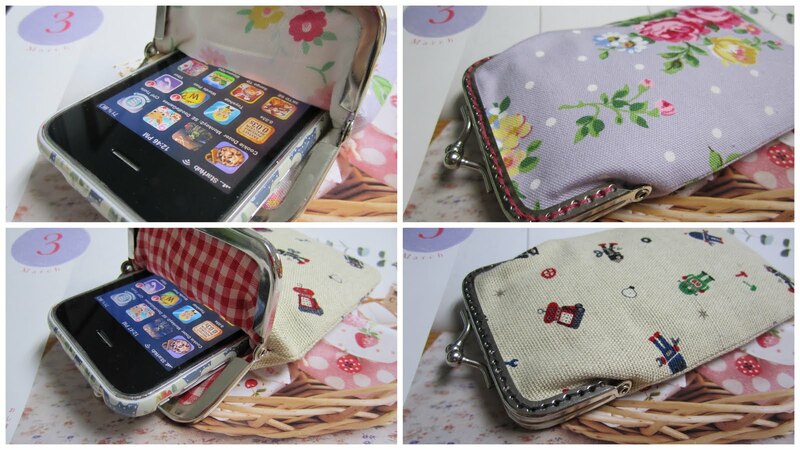 Thanks for buying my handmade pouch :D The purple floral iphone case is for sale @ belle maison (I will pass it to her later this week). She's having her fair @ liang court now till end of the week. I could get her to reserve it for u and u could either go down to collect it or would u prefer it to be mailed to you? i want one for my new iphone! jellbellfrhell : u got your new iphone alrady!?! finally?! ?